Getting an education is more than just classroom experience: it's getting involved. Biology faculty welcome student participation in research projects, and working with faculty and fellow students builds lasting bonds beyond academic grades. In addition, the Department sponsors two student organizations for students to interact with others who have similar interests and career goals. These organizations include a chapter of the Beta Beta Beta Biological Honor Society, and UT-Martin's own pre-professional society, Mu Epsilon Delta. Learn more about research opportunities and how to be a part of MED or Tri-Beta. The Department of Biological Sciences office is located in 249 Brehm Hall and faculty offices are also in Brehm Hall. 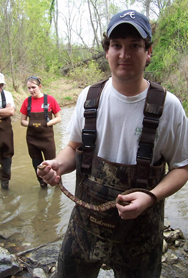 The department is active in teaching and research activities on campus, and at Reelfoot Lake Teaching and Research Center. Facilities include modern laboratories for teaching and student/faculty research, as well as museum space to house an extensive teaching collection of regional animals and plants. 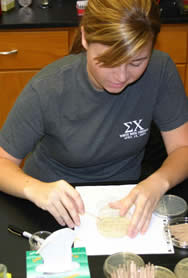 Off campus Biological Sciences courses are also taught at the UT Martin centers in Selmer, Ripley, and Parsons, TN. See the Office of Educational Outreach for more information. The Department is affiliated with the Gulf Coast Research Laboratory in Ocean Springs, Mississippi, where a full summer program of courses is offered. For more information about GCRL programs, please contact the department. 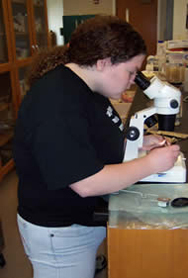 The Biology Department has several different programs of study available. As a student, the best way to get involved is to get to know the faculty, learn their interests, and find out more about their research programs.